This handy reference will give the practicing and training technologist a solid understanding of basic MRI principles on which further learning can be built. Beginning with a hardware overview and moving through tissue characteristics, image quality and flow imaging, Rad Tech's Guide to MRI: Basic Physics, Instrumenation, and Qaulity Control should be used as both an introduction and an examination preparation tool. Each book in the Rad Tech's Guide Series covers the essential basics for those preparing for their certifying examinations and those already in practice. 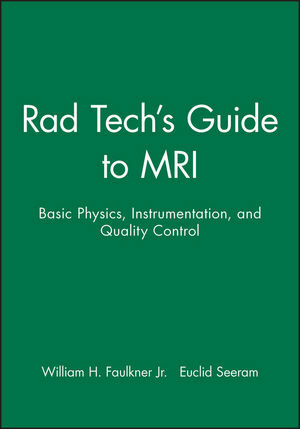 William H. Faulkner Jr. is the author of Rad Tech's Guide to MRI: Basic Physics, Instrumentation, and Quality Control, published by Wiley. Euclid Seeram, PhD, MSc, BSc, FCAMRT, has academic appointments in Medical Imaging and is Honorary Senior Lecturer in the Department of Radiology of the University of Sydney, Australia. 3. Production of Magnetic Resonance Signal. 6. Data Acquisition and Image Formation. 7. Magnetic Resonance Image Quality.